Textual Research on the Psalms and Gospels / Recherches textuelles sur les psaumes et les évangiles: Papers from the Tbilisi Colloquium on the Editing and History of Biblical Manuscripts. / Actes du Colloque de Tbilisi, 19-20 septembre 2007. Edited by Christian-B. Amphoux & J. Keith Elliott with Bernard Outtier. Pages, Illustrations: xxvi, 274 pp. "Recent research on the text of the Psalms and Gospels in Greek and in certain versions, principally Coptic, Georgian and Armenian, reveals common characteristics when attempting to separate later editions of a text from its earliest forms. The essays in this collection give concrete examples of the issues involved and suggested explanations for textual changes." Christian-Bernard Amphoux, Qu’est-ce que le type de texte “césaréen”? ... As far as the Psalms are concerned, there are four essays here. Two concern the titles, the first by Gilles Dorival. He revisits a topic that he has made his own, namely the headings of the individual Psalms in Hebrew and Greek. Mzekala Shanidze’s essay parallels Dorival’s, by looking at the titles of the Psalms in Georgian. As in other essays dealing with the Georgian versions, we are obligated to examine the Georgian ‘Vulgate’ as well as the earlier, often more fluid, pre-Athonite versions, and note any differences and changes between the texts. Florence Bouet homes in on two highly significant variants in the Psalms, those at Ps. 118 (119):5 νόμος/λόγος and at Ps. 129 (130):5 νόμου/ ὀνόματος. ... Obviously here Christian and Jewish influences seem to be in evidence but the attestation as a whole cries out for explanation. Moving to the New Testament and the Gospels there are eleven major contributions in this volume. The first, by Christian Amphoux, concerns itself with the Caesarean text-type. Amphoux’ own distinctive contribution to the history of the New Testament has been to locate the differing forms of text within the history of the fissiparous early church and his idiosyncratic and carefully-argued conclusions are to be found in the essay here. ... Amphoux is a keen defender of the Caesarean text-type and his paper here stresses the position of this form of the Gospels in relation to other text-types, ‘Western’, Alexandrian and Byzantine. As a corollary to Amphoux’ paper, Didier Lafleur’s contribution happily meshes with it. He fortuitously writes about the text of a major Caesarean witness, namely Codex Koridethi (Θ, 038), a manuscript that happens to be housed in Tbilisi. Alongside that, his new collations of the manuscripts of family 13 in Mark confirm the homogeneous character of this family and he also shows the agreements of the family with not only Koridethi but also minuscules 28, 565, 700 and uncial W 032. He establishes that one of the family members, minuscule 788, stands closest to the archetype of that family and how frequently family 13 as a whole allies itself to Codex Koridethi. Consequently, he, like Amphoux, encourages the use of the Caesarean text-type (obviously not a geographically-centred ‘local’ text) as a serious and distinctive grouping and a legitimate textual form found not only in Mark but in the New Testament Gospels as a whole. J. Keith Elliott’s essay focuses on two other early Greek manuscripts א 01 and Vaticanus B 03 particularly in that perennial textual crux, the ending of Mark which they conclude at 16:8. These two manuscripts are both accorded separate sections amid the seven differing manuscripts of Mark in Marc mutilingue as both demonstrate differing textual stages in the history of Mark. But they happen to agree in their form of the ending of Mark and are the only two ancient Greek witnesses to the shorter text. Among other supporters of the shorter reading are the two earliest Georgian witnesses. Elliott’s paper shows whatever Mark’s original intention may have been – and it is unlikely that anything he may have written beyond 16:8 has survived – his Gospel once circulated in the truncated form now exhibited by these two old Greek uncials. Inevitably, and within the second century, attempts were made to repair the damaged ending and Mark was duly provided with a ‘proper’ and satisfying conclusion that included references to the anticipated post-Easter appearances. The longer ending, commonly numbered Mark 16:9-20, represents a later editing of the text of Mark and, as such, belongs to a history of this Gospel that had an inevitable impact on a reader’s understanding of Mark as narrator and on his theology. Rius-Camps’ paper advocates the use of this bilingual [Codex Bezae] in any establishing of an edition of Mark. Jenny Read-Heimerdinger looks at D in Luke. Based on her and Rius-Camps’ studies of D in Acts, she is prepared now to promote D in Luke as an early and coherent writing that must be taken into account because it represents the first volume of a comprehensive ‘demonstration’ of the claims of Christianity from a Jewish perspective. Luke 24: 13-35 is taken as an example to show how Jesus in this work was interpreted in Jewish written and oral traditions. As befits a contribution by the director of the Orioni project at Tbilisi State University responsible for examining the Georgian Gospels, Sophio Sarjveladze’s essay is an over-arching survey that may be seen as a worthy introduction to the other essays in this volume dealing with aspects of the Georgian version. But as is typical of most articles in this volume, broad principles and generalised summaries give rise to, and are indeed supported by, specific and well-chosen Biblical references. Sophio Sarjveladze’s examples reveal the complexity of her text-critical researches and the care with which her team’s efforts are rooted in close philological examination. Following this is Bernard Outtier’s essay. With his long-established and wide-ranging expertise in Georgian studies he is well placed to proffer a general survey of current research in the area of the Georgian version of the Gospels and its text-types. He appends a valuable bibliography. Once more we are enabled to observe parallels between the materials and methodologies applied by Georgian scholarship and those relevant to other versions as well and also to the Greek New Testament manuscript tradition as well. Attached to Outtier’s piece is an important but now inevitably outdated article by David M. Lang (1924-1991). Darevan Tvaltvadze’s article narrows Outtier’s and Lang’s surveys to the Georgian manuscripts emanating from the Black Mountain where Georgian monks produced a distinctive form of the pre-Athonite Gospels that began a process of examining the Georgian against the Greek. Her analysis of certain of the Black Mountain manuscripts reveals where older readings still survive. These manuscripts thus form a median position between the oldest forms and Giorgi’s Athonite Vulgate. Focussing even more narrowly, Manana Machkhaneli examines one Georgian manuscript under the microscope, namely the so-called Anbandini manuscript. Following her researches into its distinctive readings she reports here that she has been able to place it in the family tree of Georgian Gospel manuscripts as a ‘mixed’ type, comparable to the Ksani manuscript that shared some characteristics with the protovulgate text and with the Adish recension but which also has singular readings. Another building block in the multifaceted history of the Georgian Gospels now seems to have been placed. 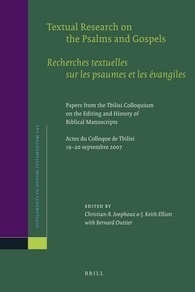 Shortly before the Tbilisi colloquium in 2007 we became aware that a publication was about to emerge that concerned Biblical writings in a hitherto virtually unknown language, Caucasian Albanian. It was entirely appropriate that one of that publication’s editors, Jost Gippert of Frankfurt am Main, should introduce that version and its importance, especially in its relation to the Georgian and Armenian versions. In the time between the conference and the present book the publication appeared. As a consequence, Gippert’s paper here is a revision of his original text which describes the recently deciphered manuscripts. As well as having this insider’s contribution, it seemed worthwhile to append to it a review of it by Simon Crisp of the United Bible Societies. His review was commissioned as an article for Novum Testamentum and is reproduced here to emphasise the significance of this new version. In the present volume Anne Boud’hors looks at the situation of the Coptic, a version as early as the Latin and Syriac. Here, after a comprehensive tour d’horizon concerning the current state of Coptic study of the Gospels, she zooms in on five textual variation units in Mark to demonstrate what may be learned from the Sahidic Coptic manuscripts. She observes a harmonising tendency not only in relation to its revised version but also in the earliest redactions. Her conclusions are preliminary and tentative as work is still underway and to a certain extent pioneering in its attempt to trace and track the history of the early Coptic version. As in other essays, this article also flags up potentially profitable methodologies that consider variants not only within one particular tradition but in connexion with other versions. The approach again is interdisciplinary and cross-cultural. Perhaps lots of other people have, but I haven't seen basileia written as a nomen sacrum. (I mentioned this to Larry Hurtado and he hadn't either.) I think there is one in POxy 5072. Richard Goode has discussed the Egerton Papyrus's use of basileus as a nomen sacrum (in the 2007 Birmingham conference volume), and I looked at the nice photo in Bell and Skeat, and interestingly the supralinear stroke starts in almost exactly the same place there as it does in POxy 5072 - at the very end of the beta, almost at the beginning of the alpha. The abbreviation is - mutatis mutandis - in the same form as well (BALEUSI in P.Eg. and BALEIA in the text below). It is quickly running to the end of this year, and it started to look like as if no exciting books were going to appear this year at all. However, when I came in Tyndale House this morning, I found an unexpected but most pleasant surprise waiting for me. Vemund Blomkvist had sent me his dissertation on the Euthalian apparatus. Vemund Blomkvist,The Euthalian Apparatus: Text, Translation, Commentary Series of Dissertations Submitted to the Faculty of Theology, University of Oslo / Acta Theologica 39 (Oslo: Unipub, 2011). So far I have had tremendous fun with this study, which does exactly what the title says (with the limitation that it concentrates on the chapter titles (κεφαλαια - τιτλοι), the introductions to the big divisions (προλογοι), and the υποθεσεις to the individual letters. Blomkvist's interest is not text-critical but that of reception history - which is totally legitimate, especially when one puts so much work into translating and bringing together all this material that is also of interest for people with different questions. Truly original work, and research that will spark off other research. Just the translation of and commentary on Euthalius would have been tremendous, but Blomkvist also throws in the 'Marcionite' prologues (which I actually hold to be originally Marcionite - pace Dahl and Ulrich Schmid), the Priscillan edition (from the Latin), the υποθεσεις on Paul of Theodoret, and the same by Theophylact. I hope to come back later with some further thoughts, but one of the fascinating gems is worth sharing straightaway. Since the author had worked with and has access to the notes of the late Nils Dahl, he mentions a discovery made by Dahl in four Latin mediaeval manuscripts of Monte Cassino where the Euthalian prologue to Paul is fused with the Muratorian canon. Harnack had discussed the Muratorian part back in 1898, but did not mention the importance of finding Euthalian material in Latin. Congratulations to Vemund with this excellent dissertation! See recent discussion about this codex on this blog here. Brent Nongbri presented an interesting paper on the subject of dating with focus on P66 at this year's SBL in San Fransisco. See here and here for background and criteria. De Bruyn has also published an essay on the subject in a Brill volume on Early Christian Manuscripts edited by Kraus & Nicklas (see here). There are also reviews of the Oxyrhynchus Papyri volumes 73 and 75. By the way, the new book review editor of the journal is AnneMarie Luijendijk (Princeton University), also chair of the SBL Annual Meeting program unit of New Testament Textual Criticism. I take this oppurtunity to mention that the electronic archives of this journal are maintained by the University of Michigan who has made available volumes 1-46 (1963-2009) on-line. Here you have articles and reviews that could keep you busy for days.